Active in many horticultural leadership roles Matt's day job is quite different. Professionally Matt works as a Principal Designer at toy and entertainment giant Hasbro, Inc. (Pawtucket, RI), but that doesn't preclude his deep involvement in many plant societies and botanic gardens. Matt Mattus has been involved with horticulture throughout his career, which began as a kid aged 9 years old who wandered into Horticultural Hall after a weekly piano lesson in the city and who decided that he too could grow marigolds and exhibit them! By age 10 he was exhibiting as a 'junior exhibitor' in the many plant society shows held at Worcester County Horticultural Society's Horticultural Hall in Worcester, MA throughout the 1970’s. 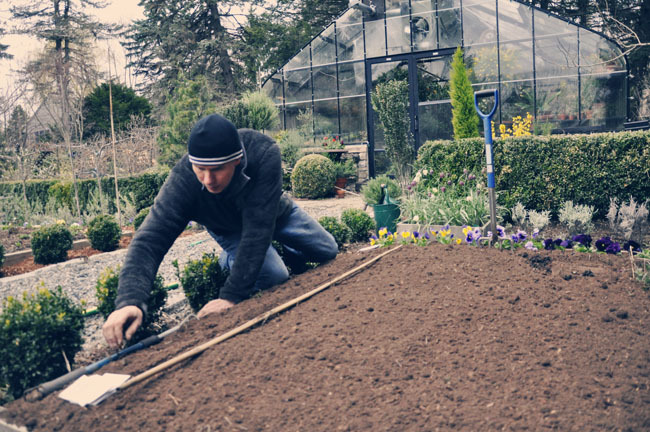 A lifelong passion for horticulture hasn’t kept Matt from various governance roles. Presently, he is a trustee and Vice President (elect) of the Worcester County Horticultural Society where he serves on the Board of the Tower Hill Botanic Garden (2015 – 2018) and sits on a number of committees including the Master Plan, the Children’s Garden, the Programming as well as on their most recent CEO Search Committee (s). 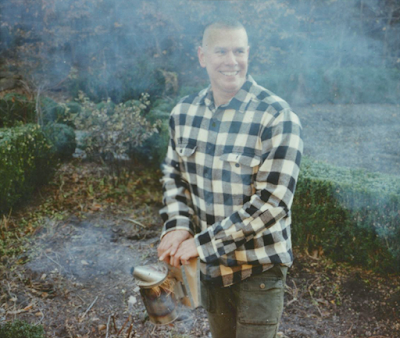 Matt is also president of NARGS (the North American Rock Garden Society), a member of the Scottish Rock Garden Club, the Alpine Garden Society (UK), the American Primrose Society (past editor), and founder of the New England Dahlia Society to name a few. 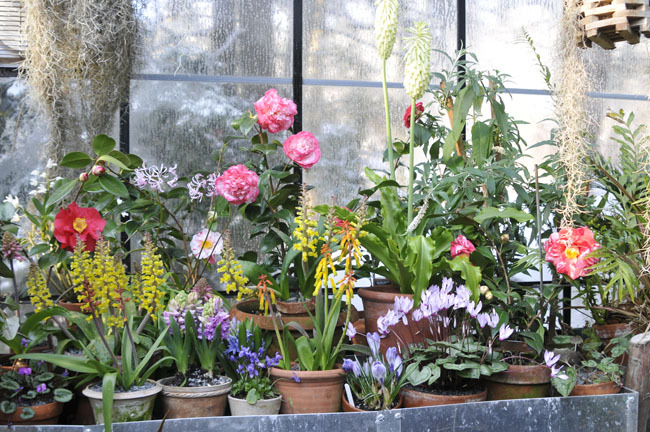 He also speaks frequently about his passions at botanic gardens and plant societies which includes a wide range of topics ranging from South African Bulbs to nineteenth century conservatory plants to high-elevation alpines. 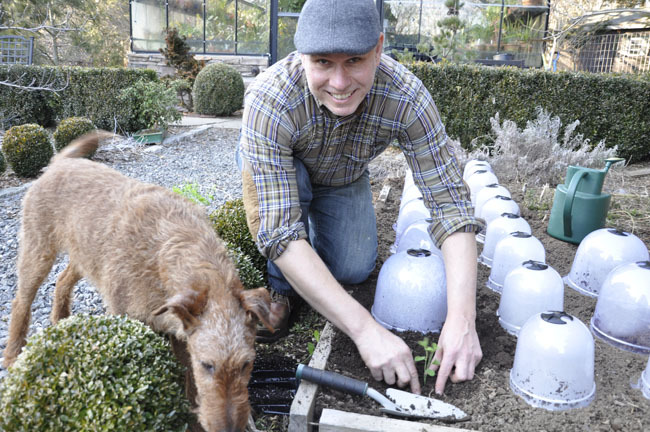 As the author of the award winning gardening blog GROWING WITH PLANTS.com, Matt often features many of his travels and in-depth horticultural projects ranging from English Sweet Pea culture to growing and training exhibition Chrysanthemums. 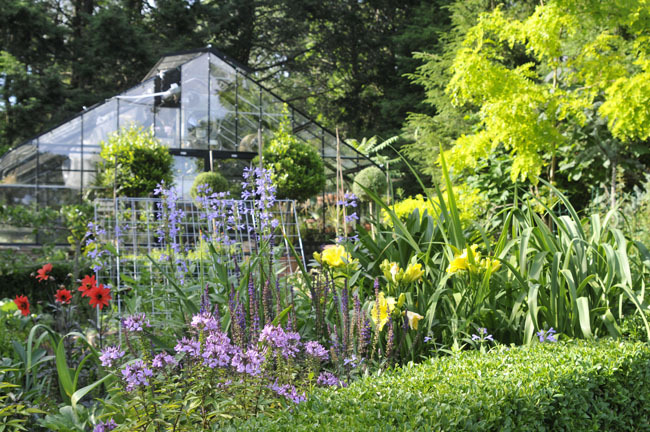 His Greenhouse and gardens have also been included in many popular magazines blogs and books including Martha Stewart Living (Nov. 2016 – Chrysanthemums), House & Garden (Nov 2016, South African Bulbs), and Better Homes & Gardens to name a few. Matt and his partner Joe live in Worcester, MA, with three lovable Irish Terriers, many chickens, Indian Runner Ducks and Tom the turkey. Preparing freshly dug roots of Belgian Endive for forcing. Hi! I'm Matt Mattus - and as if you couldn't guess by now - a life-long plant geek. 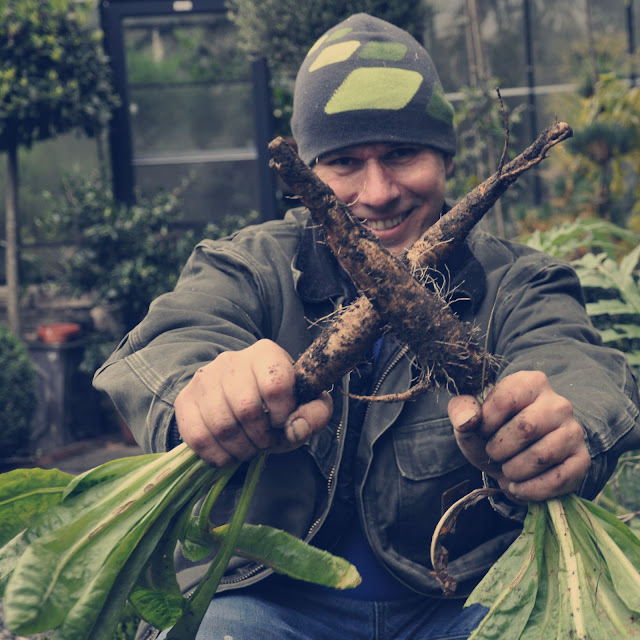 Ridiculously obsessed with all types of horticulture, some people describe me as a 'Rennaissance man' (but honestly, we all know what that really means - simply that I am a bit crazy!). As a professional designer (only meaning that I make my living as a creative person) I prefer to define myself as one who is constantly curious, yet aware that throughout ones life, one is constantly learning. That is what this blog is really all about. Being curious, discovering and learning. A consummate optimist, I try to focus more on all the good things about life, plants and gardening, and although I know that it helps that I am fortunate to have a greenhouse, a big garden and the means, I also recognize that I've been blessed with this rare gift - something which believe me, I never felt was a gift!). You see, I was born, raised and now live in the same house where my dad was born (BTW - he passed away a few years ago at 100 - all's good though-he had a great life.). It's also the very same home that my grandparents built back at the turn of the last century). That said, no matter what you may think, it really isn't all that fancy. Our home is located in Worcester, MA, in a working class neighborhood with increasingly low property values, and speeding cars, pit bulls and loud music. It just looks good in pictures! I currently work for Hasbro - the toy and entertainment company (and I mean - for a long time - nearly 28 years now!). I've been lucky to hold various, lead creative roles, most recently as a Futurist, in their Invention Lab. What does that mean? I can't really say much about what I do at the office, but it's safe to say that I am involved with things which may not be seen for 5-10 years from now. So, OK - why do you write a gardening blog then if you are a toy designer? The answer here is "I just can't help it. Maybe because I enjoy collecting and discovering new things or attracted to whatever is 'interesting', it doesn't feel all that odd to me. As a curious person who creates, why wouldn't I want to search for, collect and raise amazing rare or unusual things?. I suppose I do take it all a step further though, since as a designer, aesthetics is important to me as well. Ok, so really? You live in Worcester, MA? Yes, I live in Worcester, MA - one hour west of Boston. Although I've travelled and lived elsewhere, it's just home to me. You'll understand in a moment, but for some strange reason, even though I could have moved anywhere in the world, I ended up here again -Sure, the neighborhood is a bit more crappy now, and if it doesn't get better, we will need to move, but for now - it's great place to garden, we are close to the city with had it's benefits, and I consider myself fortunate to have such a connection most of my life - a connection which is literally being rooted in a place that has been in ones family for a few generations. I dream of moving to Vermont, or Seattle, or Switzerland, but that will probably never happen. I live here with my partner of 30 years Joe, and our many dogs (we also raise champion Irish Terriers, as well as some poultry, the occasional exotic cage bird - many Spanish trombetto canaries, and a general mish-mash of random creatures which find their way onto our property. Joe really likes animals, and I like plants (he does too) so let's just say that this house is 'very lived in', there is often dirt on our floor, and to be perfectly honest, our cleaning lady quit. That's how messy we are! For two gay guys, we somehow never got that gene. What are you trying to achieve with this blog? Here is how I began blogging. As a plant nerd I just couldn't find any other blogs (or magazines, books or TV shows for that matter) which delivered what I craved - basically, simply satisfying , in-depth content that wasn't just brief 'sound-bites', over-simplified or repeated information that just wasn't correct (believe me, there is plenty of that out there already. As a blogger, I break all the rules. No top ten lists, no SEO crafted headlines, no keywords embedded into the text to garner more page hits, yet - I get a ridiculous amount of traffic. I suppose it's all due to what Google advises - "just write good content and the readers will come". I don't write about novelty methods, no upside-down tomato plants, I don't promote 'hip' or 'trendy' gardening 'tips and trick's like how to soak amaryllis bulbs in manure tea (don't), or airplants as disposable decor or even plant pots or containers as instant display containers with mature plants - I don't really practice permaculture (the proper way - I just can't wrap my head around the concept yet unless I owned 400 acres and lived in zone 7! ), and although I am 98% organic, I am not opposed to such things as carefully applied insecticide, fungicide or chemical fertilizer (it's all chemistry to me.). I also don't have strong opinions about GMO's (I support and appreciate science and plant breeding for the advancement of humankind), yet I do not support using systemic insecticide most everything, especially on any food crop.I urge organic principles for the sustainability of our environment naturally, - be it for pollinators or any bits of nature which may be harmed. Yet from time-to-time, I am not opposed to step in to control something more serious, be it an injectable insecticide on a rare tree to save it from an infestation, or to save something else which is precious. Yet always, use caution and a wise mind when considering such 'chemotherapy'. I mostly grow organically outside however (I should have mentioned that any insecticide is used predominately in the greenhouse, and at that, only for the most extreme infestation like scale or mealy bug - usually, a fungicide is necessary at certain times of the year). In the veg garden, nothing other than our own compost is used along with exact regimens of fertilization - which IS mostly chemical, as each species requires something different. I carefully adjust everything from pH to iron and phosphorus with each plant, which is good horticulture. 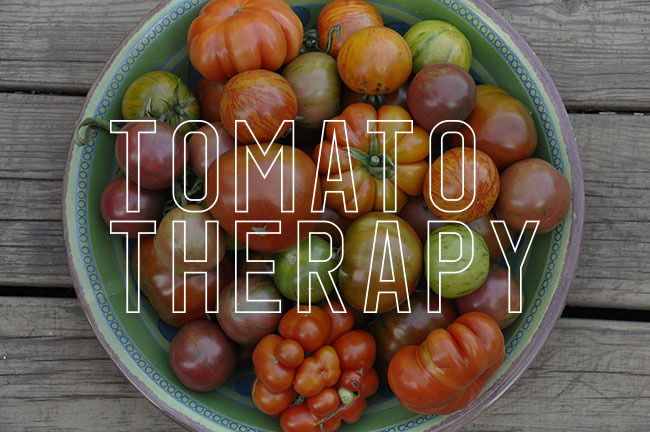 Nothing gets me more ticked off than when I see someone suggest broad statements such as "Apply a solution of Epsom Salts to the entire garden in the spring" or "Crush egg shells and lay them around your tomato plants". I like to say things like "Gardening is science, not a craft. "and I'm not trying to be snarky here, I am serious. Look - you owe it to your plants to research exactly what each plant needs in order to grow right. Look - You wouldn't feed all the zoo animals white bread or raw meat, right? A penguin may need some odd micro-plankton while an antelope might need more zinc (just guessing!). So while one may suggest soaking amaryllis bulbs in manure tea before planting? Any botanist may share with you that Amaryllids require low nitrogen, aside from the fact that regardless of what the blogger may have advised, fertilizing a bulb which you plan on disposing of once blooming is completed is useless, it's akin to soaking a chicken egg in milk - everything that flower needs is already in the bulb. Why didn't you make a career out of plants? Open a nursery or something? I will eventually write a book, (but it would have to be an extraordinary one!). I'm beginning to sense that I have something kind-of special happening here - content wise. After ten years of blogging, I had better! I just don't know what to do with it yet. Don't you worry about running out of ideas or content? 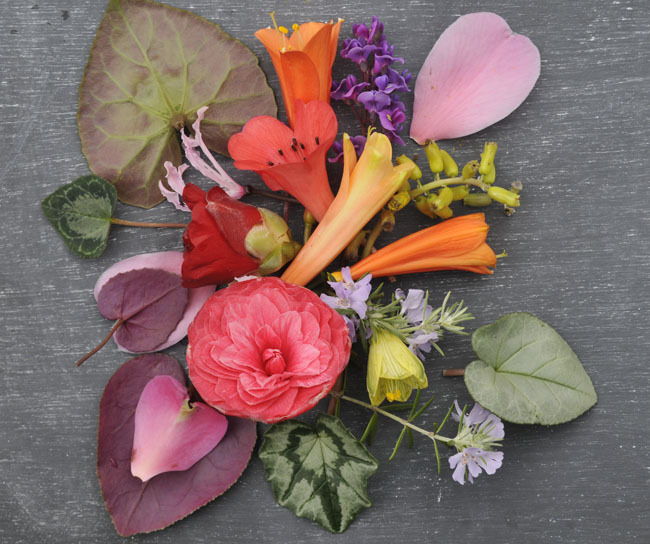 No really, and this just may be because my site chronicles my personal journey with plants, it's basically a diary of what I am growing at the moment, and what is currently happening in the garden or in the greenhouse. Every year, even if it's the same month or day, it's different. The greenhouse and the gold and blue perennial border ( yeah, and touch of uninvited red!). Somehow, it works - even with the ugly cucumber grate showing. So, that greenhouse of yours…what's the story there? OK, don't hate me, but yes - I have this rather awesome glass greenhouse (grin). As great as it is, believe me, it's also a burden when it comes to heating it! There will a day when I cannot afford to heat it, and then, I will probably be converted into a winter garden or a sort of alpine house. A bulb plunge bed in late February - like having my very own personal spring flower show. The greenhouse is my amazing space, and I love it. It's my studio, my laboratory - really, it's my version of a man-cave. It was built over my part of my parents old vegetable garden, which had been a cultivated for about 100 years, so the soil below it is deep and rich from all of those years of compost and chicken manure which my parents (and grandparents) enriched the garden with. So I designed the greenhouse to have a deep foundation (buried into the ground 6 feet deep) but it has an open soil floor inside, so I can plant camellias and trees into the ground. Now, in the ground where tomatoes and beans once grew, grow citrus trees and Acacia’s and Camellias - all enjoy that rich soil which took years to create. It's heated with propane (and on those lucky sunny days in winter, solar). 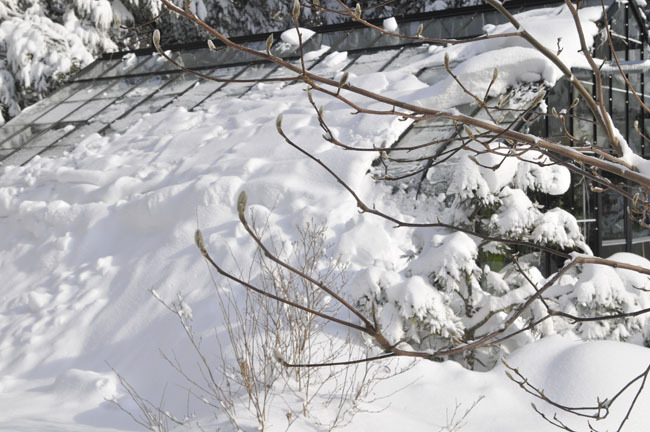 The greenhouse during the 76" record snowfall during the winter of 2010-2011, amazing, right? Of course, we live in the Atlantic snowbelt, so Worcester can get dumped on with 3, 4 or even 5 feet of snow in just a single month(no worries, I love snow, and I love winter thank God!). I just need to keep the snow off of the glass roof. Inside the greenhouse I grow so many things - (ok - far to many things). Aside from the many citrus trees there is random collection of interesting tropical and sub tropical plants and this included some cacti, succulents, shrubs and trees, camellias and alpine plants. Mostly I focus on rare or unusual bulbs, the winter-blooming sort from South Africa, South America and the Middle East as these are perfect growers in a cool house. Clivia, cyclamen species, narcissus, nerine and most any other obscure bulb you may have never heard of, I probably grow. I am a bulb enthusiast, growing many rare or collector bulbs that bloom in the autumn and winter under glass. 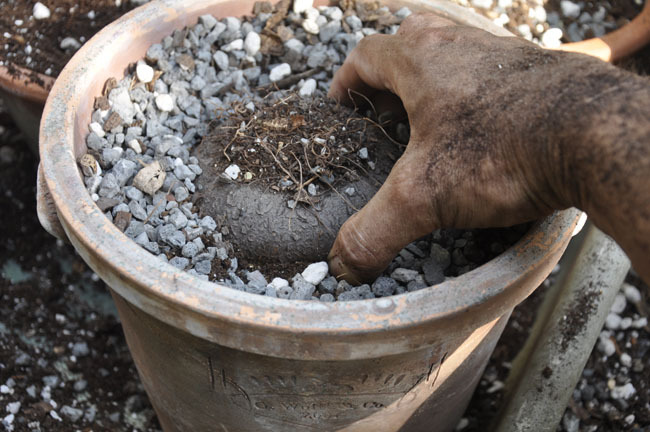 Here is a Cyclamen graecum bulb from Greece being repotted ,while dormant, during the summer. Inside the greenhouse keep the minimum winter temperature set to 40 degrees F., but on sunny days in January, temps can reach 75, (which is reason alone for investing in a greenhouse, right?. Shirtless, in humid air amidst jasmine as the snow piles up on the other side of the glass in January is an unspeakable luxury. It's kind of awesome on a sunny February or March afternoon too (but not at night when it ices over). Planting out early Spencer Sweet Peas for cut flowers in March under cloches. Fergus our senior Irish Terrier assists. I'm focusing on the greenhouse here, but outside, there is still an entire garden, much of it rambles on and on across 2 and a half acres. Here is where I grow most of the 'projects' that I wrote about, be it Chrysanthemums, sweet peas, cut flowers, forced endive and Sea Kale and everything else one might expect in a plant lovers garden. There are trees - some are tall, because they'v been growing here for about 100 years as my uncles had a landscaping business in the 1930's (some old cultivars here are mature! ), but to be honest, much of this garden is just overgrown, and many trees need to be removed. It doesn't look as great as it all did in 1965 for example. I do welcome visitors but be prepared. If you ever visit, I will admit that things look far nicer in photos than it does in real life! - Really. I promise you that there will be weeds, a messy house and most likely lots of dog poop on the paths. 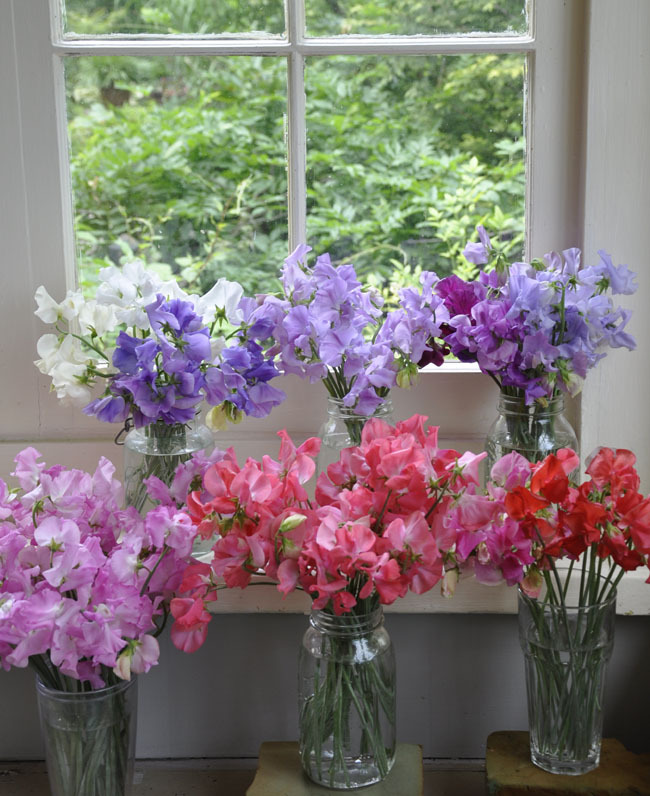 One of my crazy projects - English Sweet Peas from the summer of 2012. 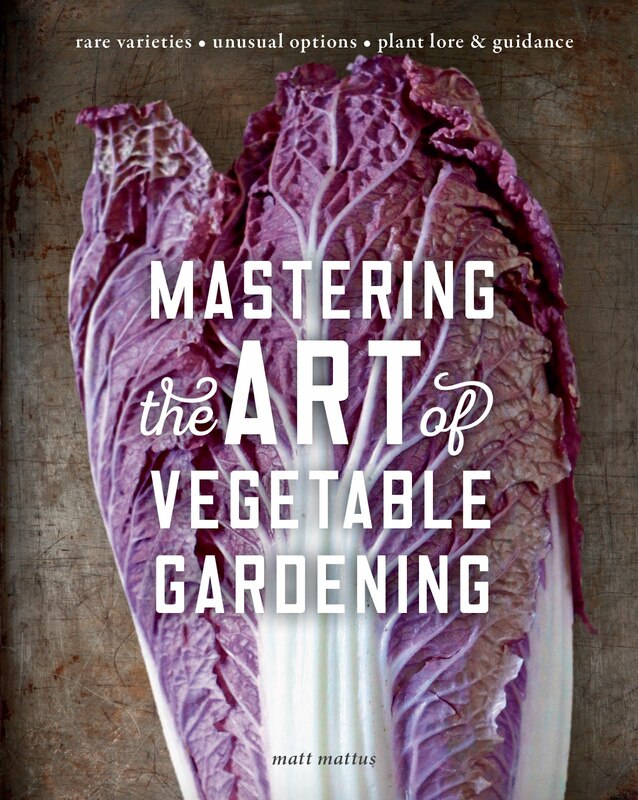 Where did you get all of your gardening knowledge from? Mostly, it's self taught, ( I did go to college majoring in Horticulture, but I transferred mid-term to something more lucrative). My horticultural experience began as a child (8 years old?) and grew through high school where I was a hort major (FFA state president, and a national horticulture gold medal meant that I was obligated to attend Umass/Stockbridge as a hort major but only for one year. I transferred to Unity College in Maine majoring in Environmental Science/Botany. Later,a Batchelors degree in Fine Arts and design from Chaminade University in Honolulu lead me to a career in design and as an artist. I wanted to have a creative position (I did have a successful yet brief career as a contemporary well - even had a solo museum exhibition, a show at the Boston ICA (Institute of Contemporary Art) but I couldn't do everything. 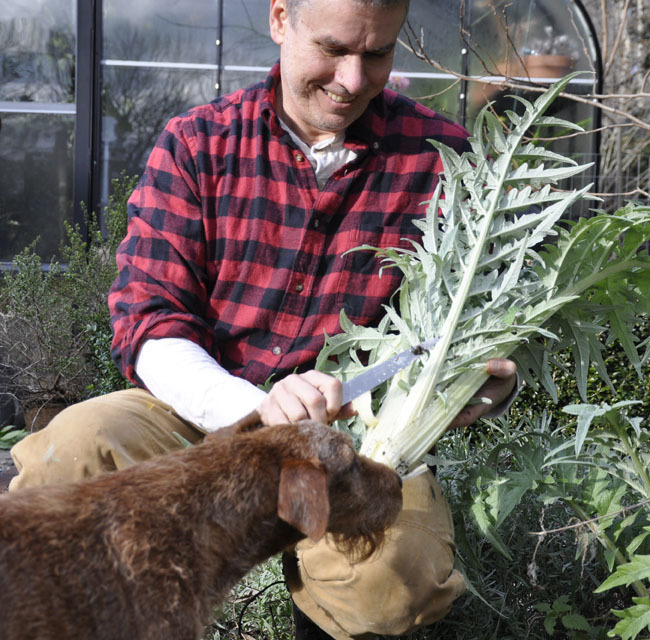 Harvesting Cardoon in November. Fergus assists. It sounds like you belong to some plant societies - how many? I became obsessed with plant societies back in the mid 1970's - mostly because I was already entering the summer shows at Horticultural Hall (the Worcester County Horticultural Society) and every other weekend a show was sponsored by a different plant society. It was how I became introduced to hosta, daylilies, lilies, and gladiolus. I wanted to not only master all of those plants and exhibit them, I entered and competed in the flower and vegetable classes as well. Clearly, I was not behaving like your typical kid. Plant societies became my 'little league', often I was the youngest (by far) in most of these exhibitions, but I learned so much at an early age from the masters, be it Siberian Iris breeders, exotic vegetable farmers or fruit orchardists. By the time I entered high school, I had a bedroom, full of ribbons for my gladiolus, dahlias, melons and peas. On the first day of my horticulture class I remember the instructors face when he decided to quiz the entire class with samples from his own garden - I think I was able to identify everything (even a mimulus and a lewisia), which thankfully I was rewarded with a coveted 'greenhouse pass', where I could work on my own projects and not have to sit in class, or even have to take gym! If I was born ten years later, I probably would have ended up somewhere in public horticulture, at Longwood or Kew, but for some reason, those careers never were suggested or arose on my radar. Somehow, it all worked out, as a corporate career still offered me the opportunity of travel, and the means to collect. So, how do you find time for all of this? (exhales deeply) Yyyyyes, this is the question I get asked most often. My answer is.....I don’t really know how, I just do it (and most of the time, I feel that I really don’t do it very well, since I rush things). I think lots of people work this way. My psychologist says that I am just a 'high-functioning' person, whatever that means. I guess it's like other people I know who are high functioning, Martha Stewart gets only 4 hours sleep a night, so do I. I'm a morning person, I party hard but prefer to be focused, and alert, working on something serious, and I am more likely to try and perfect the culture of something - to master the art of it, if you will. As for this blog, I know the writing is poor, there will be errors and misspelling because it is unedited.I can't help with the poor grammar and blog-speak because at the end of the day, I am not really a writer - I am a plantsman. Others decided to blog because first, they were writers, and then learned to appreciate and grow plants, for me, it's the other way around. Neither is right, nor wrong. How did you start gardening in the first place then, did your parents force you? My sister and brothers will agree with me that they did force weeding and endless garden chores though! I remember two things about my childhood more than anything else. First, my parents were super-hero gardeners, ( I mean, they were more practical and grew great volumes of useful things, be they flowers for church or vegetables for the storeroom and root cellar). They were depression-era parents (Dad was born in 1914, and mom in 1919), married in 1940, they had a real victory garden, and those values continued through the 1950's when my siblings were being raised. I came along a decade later (oops!) so raised in the 1960’s and 1970’s. 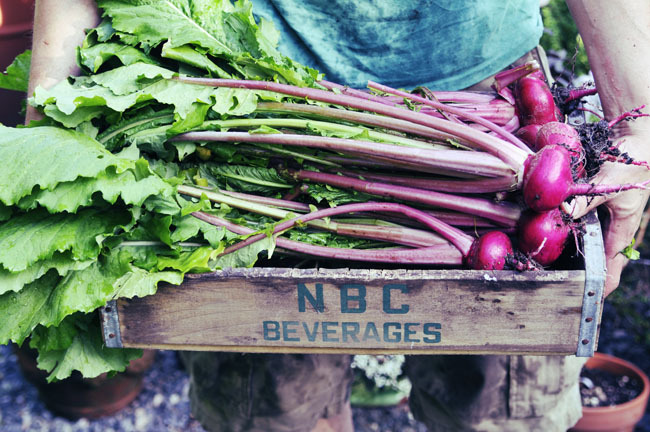 A time when concepts like organic gardening and all-natural began to seep into culture, but by then, it wasn't novel for my parents, it was just how they functioned for the past 40 or 50 years. I should mention that they were ethic as well (all four of my grandparents are from Lithuania) so there was weekly foraging trips - 'picking wild mushrooms, wild blueberries and wild nuts, strawberries, grapes - as a child, you naturally love these family events, even though it was hard work (bushels of wild mushrooms). 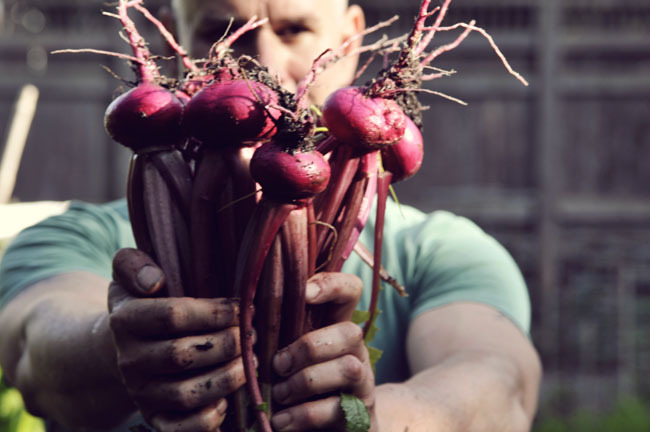 So it all just gets in your blood, and you know it, or have a unique perspective on things like permaculture or even the word 'foraging'. For us, it was just 'picking mushrooms that were much better than the ones found in the store. What about your plants and images? Do you really grow everything? Unless I am visiting a garden, all of my posts are of plants which I grown and photographed myself. This is so important to me, for as some garden writers often write about plants that they never have actually grown themselves, in a world of Google, having someone at hand who has actually raised the plant, either successfully or not, is something unique. I know, that's whom I would want to listen to when it came to learning about a plant. 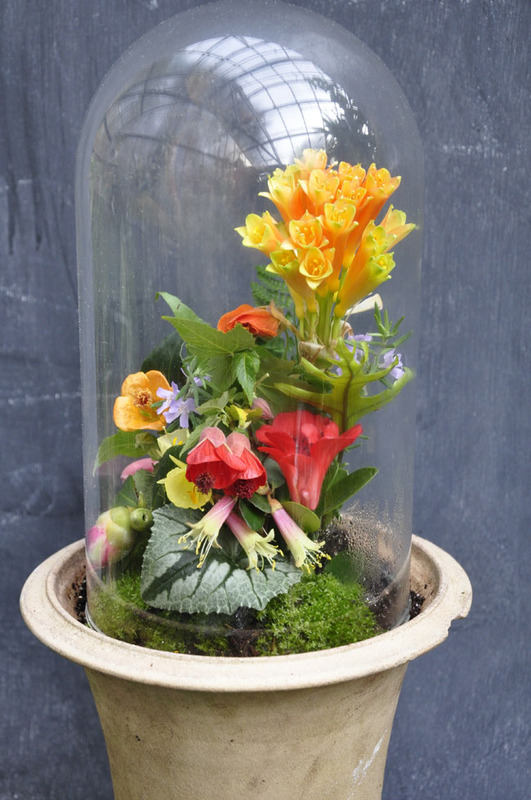 I am so inspired by 19th century gardening, that I like to recreate the experience -like this New Year's day dome with flowers that would have been found in a New England greenhouse in 1805. Amazing, right? This idea of collecting factors in as well, since I often make it a point to grow more than one species within a genus, and I particularly like to try and find numerous species of one genus to grow from seed, so that I can share all of the subtle differences between the genus. Last year I sowed more than 250 species of Lithops for example, with the hopes of learning about each one. Insane, I know. Display and design factors into this mix at some point as well. Part of the pleasure I get from gardening is the visual appeal. I know that to some it may sound silly, but I would never raise seedlings in Dixie cups or egg cartons (if I was really broke, maybe I would), but I know that clean, sterile pots are affordable and the best material for some seeds which might need black plastic for the proper temperature, or clay for moisture. Seed containers often must be able to be nested, or lined up on a bench in a flat so that they don't get tipped over. All factors are considered before I select any container. I would say that I treat my plant collections like museum collections, - really. I curate everything, for how I grow my plants, to how I display them. I even install 'installations' in my sand beds, which may focus on a seasonal theme (like autumn blooming crocus species or cyclamen), or to show numerous species of one type (Lachenalia) . I am always on the look out for rare seed from expeditions as well, or traveling to unusual destinations myself to collect seed, be it Iceland, the Italian Alps, South America or Japan. If you have more questions, let me know - I will be glad to answer them! Thanks! In the end, I know that it's a lot of 'a lot'. This blog may not be for everyone, but I believe that if you love plants, or even nature, that you might find something of interest here. I hope that you find it horticulturally interesting, well designed and inspirational. Even more so, my wish is that it inspired you to try something different in your own garden!